This article is about the namesake of Harvard College. For John Harvard, the statue in Harvard Yard, see John Harvard (statue). For other uses, see John Harvard (disambiguation). Harvard was born and raised in Southwark, England, the fourth of nine children of Robert Harvard (1562–1625), a butcher and tavern owner, and his wife Katherine Rogers (1584–1635), a native of Stratford-upon-Avon whose father, Thomas Rogers (1540–1611), was an associate of Shakespeare's father, both serving on the borough corporation's council. He was baptised in the parish church of St Saviour's (now Southwark Cathedral) and attended St Saviour's Grammar School, where his father was a member of the governing body as being also a Warden of the Parish Church. In 1625, the plague reduced the immediate family to only John, his brother Thomas, and their mother. 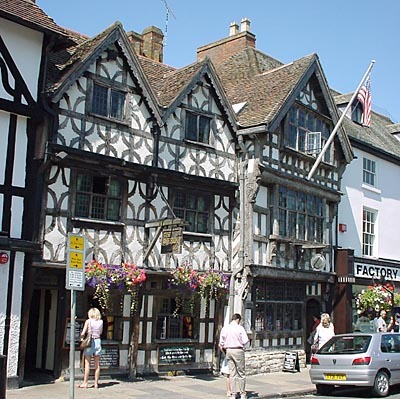 Katherine was soon remarried—firstly in 1626 to John Elletson (1580–1626), who died within a few months, then (1627) to Richard Yearwood (1580–1632). She died in 1635, Thomas in 1637. Left with some property, Harvard's mother was able to send him to Emmanuel College, Cambridge, where he earned his B.A. in 1632 and M.A. in 1635, and was subsequently ordained a dissenting minister. In 1636, he married Ann Sadler (1614–55) of Ringmer, sister of his college classmate John Sadler. On 14 September 1638, he died of tuberculosis and was buried at Charlestown's Phipps Street Burying Ground. In 1828, Harvard University alumni erected a granite monument to his memory there, his original stone having disappeared during the American Revolution. 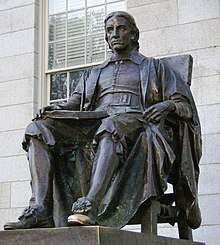 A statue in Harvard's honor—not, however, a likeness of him, there being nothing to indicate what he had looked like—is a prominent feature of Harvard Yard (see John Harvard statue) and was featured on a 1986 stamp, part of the United States Postal Service's Great Americans series. A figure representing him also appears in a stained-glass window in the chapel of Emmanuel College, University of Cambridge. The John Harvard Library in Southwark, London, is named in Harvard's honor, as is the Harvard Bridge that connects Boston to Cambridge. ^ Conrad Edick Wright, John Harvard: Brief life of a Puritan philanthropist Harvard Magazine. January–February, 2000. "By the time the Harvards settled in Charlestown John must already have been in failing health ... Consumption kills slowly. By the time Harvard died, he knew what he wanted to do with his estate." ^ a b Rowston, Guy (2006). Southwark Cathedral – The authorised Guide. ^ a b c d e f Wilson, J. G.; Fiske, J., eds. (1892). "Harvard, John" . Appletons' Cyclopædia of American Biography. New York: D. Appleton. ^ "Harvard, John (HRVT627J)". A Cambridge Alumni Database. University of Cambridge. ^ a b Melnick, Arseny James. "Celebrating the Life and Times of JOHN HARVARD". Retrieved 20 September 2011. ^ Edward Everett (1850). Orations and speeches on various occasions. I. Boston: Charles C. Little and James Brown. pp. 185–189. ^ Alfred C. Potter, "The College Library." Harvard Illustrated Magazine, vol. IV no. 6, March 1903, pp. 105–112. ^ Degler, Carl Neumann (1984). Out of Our Pasts: The Forces That Shaped Modern America. New York: HarperCollins. ISBN 978-0-06-131985-3. Retrieved 20 September 2011. ^ Alger, Alpheus B.; Matthews, Nathan Jr. (1892). Harvard Bridge: Boston to Cambridge, March 1892. Boston, Massachusetts: Rockwell and Churchill. p. 14. Retrieved 20 September 2011. Shelley, Henry C. (1907). John Harvard and His Times. Boston, Mass. : Little, Brown, and Co.
Rendle, William (1885). John Harvard, St. Saviour's, Southwark, and Harvard University, U.S.A. London: J.C. Francis. Wikisource has the text of an 1879 American Cyclopædia article about John Harvard. Wikisource has the text of a 1905 New International Encyclopedia article about John Harvard.